Norfolk holiday destinations Kelling Heath Holiday Park and Woodhill Park will be helping to save lives on the county’s roads thanks to a new charity partnership with East Anglian Air Ambulance (EAAA). 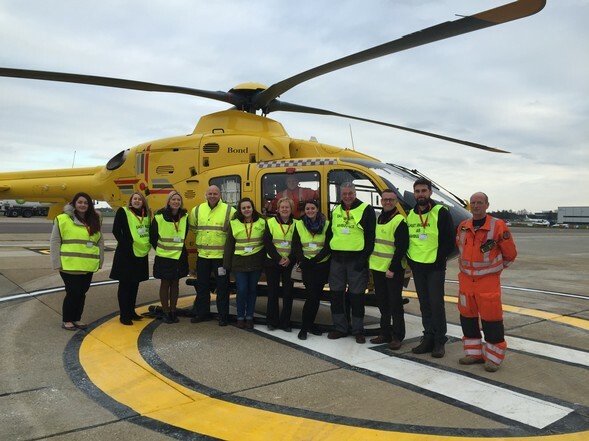 Staff at the two parks, which are run by family-owned firm Blue Sky Leisure, are hoping to raise thousands of pounds for EAAA over the next two years, following an official launch event at the charity’s Norwich Airport base. Donation tins will be placed around both parks, with various events also expected to generate funds, including plans for a joint float at both the Sheringham and Cromer carnivals later this year. Since its launch in 2000 East Anglian Air Ambulance has attended more than 16,000 lifesaving missions. It is a 365 day a year Helicopter Emergency Medical Service (HEMS) serving the people of Norfolk, Suffolk, Cambridgeshire and Bedfordshire. With a medical crew of highly trained critical-care paramedics and doctors, EAAA brings the emergency room to the patient, anywhere in East Anglia within 25 minutes. EAAA receives no regular Government funding and relies solely on the generous donations of the local community to raise the £10.2 million needed to fund the service this year.EAAA is a vital service to those living in and visiting rural communities within East Anglia. Kelling Heath and Woodhill Park raised a total of £12,000 for previous charity partner The Benjamin Foundation.